On September 26, 2018, The Wildcats hosted a meet against Cardigan Mountain School, Proctor Academy, Vermont Academy, and The White Mountain School. 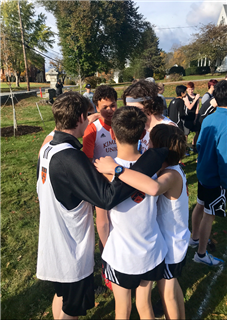 The boys team secured a win, by earning 24 points over Proctor (35 points), Vermont Academy (49 points), Cardigan Mountain School (50 Points), and The White Mountain School (65 Points). Kimball Union Academy's top five boys were: Alisdair MacPhail (3rd place, 20:35), Nate Brooker (4th place, 20:37), Jon Bruner (8th place, 21:31), Kohki Shinohara (9th place, 21:52), and Noah Farnsworth (18th place, 24:57). The girls team earned a 3rd place finish with 20 points, defeating Vermont Academy (34 points), but falling to The White Mountain School (19 Points) and Proctor Academy (13 Points). KUA's top five (and only) girls were: Eleanor Ashton (2nd place,24:19), Nancy Tran (8th place, 29:26), Ellen Hu (11th place,31:12), Kate Gao (12th place,32:29), and Olivia Xu (13th place, 32:40). The Wildcats will return to action next week with a home meet against Holderness for the traditional event of "Holderness Day".